I usually do write ups once I have the completed beer, but given the timeline for these sour/funky beers, I decided to start splitting the posts, one outlining the brewing, the second post will review the process after brew day to the final product. A big part of this blog is for me to keep my own notes and records in a place where I can retrieve the information in case of a system failure. I experienced that not long ago, and fortunately, I was able to save my Beersmith files, but I don’t want to risk that again. This will help me stay more current. On that note, I am brewing a sour stout today. I had a chance to try Madrugada Obscura from Jolly Pumpkin, and really dug the interplay of roasted notes with the brett/sour flavors. Brettanomyces and sour notes in stouts were a typical part of the flavor profile of the old porters and stouts from England and Ireland. So much so, Guinness still blends some pasteurized soured stout to their final product to give that tang. I tried my hand at a sour mash for a stout, and I think it worked very well. So this time, I am going to take it one step further. I am going to brew a stout, and will primary it with Safale 04. Once primary is finished, I am going to rack it over, and add some washings from a flemish red I just racked using East coast yeast 02 Flemish ale blend. I hope this gives me some sour and funky flavors, without dominating the flavor profile. Ok, on to the recipe. Simple infusion mash. This was mashed starting at 158F in 4 gallons of water, and stirred every 10 minutes or so. The temp drifted down to 152F over 60 minutes. 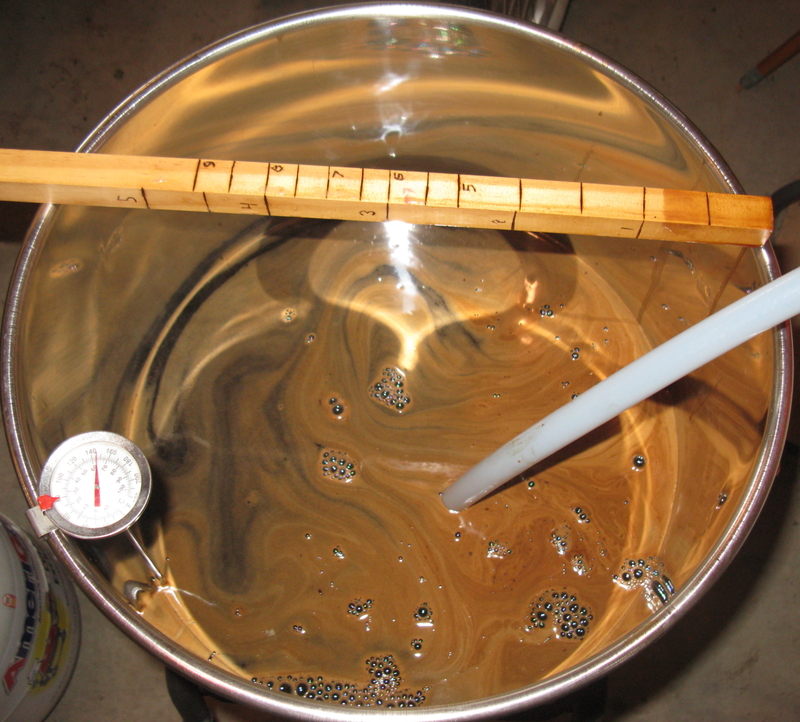 It was then vorlaufed into the brew kettle, and batch sparged with 2 batches of 2.75 gallons of 168F water. It looked like I was going to be a bit short on my volume to the kettle, so I added another 1/2 gallon of sparge water right from the HLT. This then boiled for 60 minutes, and I used my immersion chiller to cool it down, and then into the fermentor. I got 6 gallons of wort at 1.060 OG. I left it alone for a few hours in my basement to let the temperature equilibrate to the 70F ambient in the basement, and then I tossed in the rehydrated Safale 04. Mmmmmhh, spent grain on compost yummy...who needs sheep?! 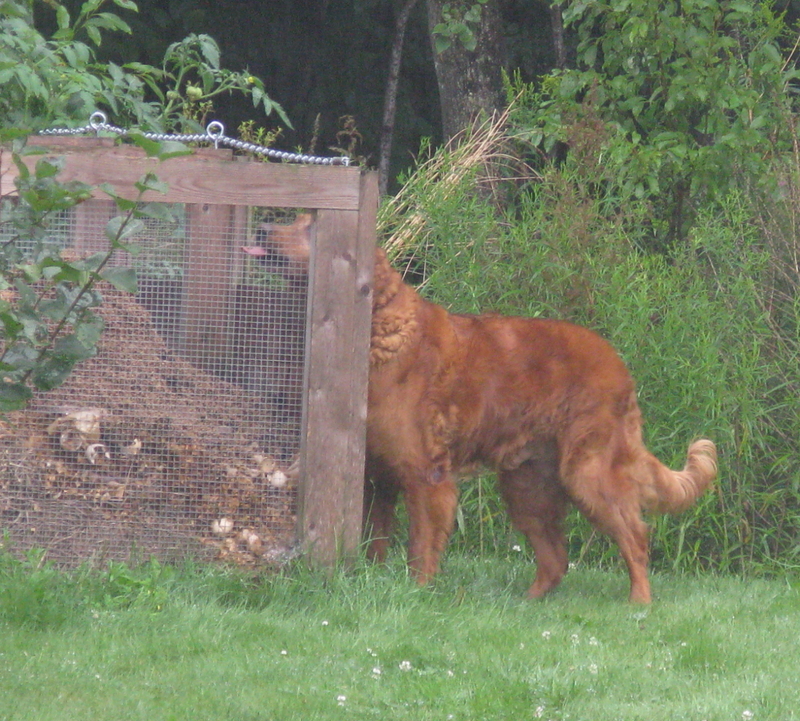 My dog seems to like brewdays as much as I do, at least, he likes to eat the spent grain in the compost bin. I guess that rules out any hopped mashes for me. UPDATE 2/3/12 — If you would like to see the tasting report, you can find it here. The FG for this beer was 1.016 unchanged for several months before I decided to keg it. This is an ABV of 5.74%. The beer was kept in primary for 2 months, then racked and the washings from another batch made with ECY 02 was added. This was allowed to sit for another 3.5 months, and then kegged. How did it turn out? I am getting ready to try to sour some stout and add cherries for St. Paddy’s. I still have not bottled it. It continues to ferment slowly, one of the risks of adding bugs, and I am worried if I bottle it too soon, I will get bottle bombs. It tastes pretty good, and I think it is about ready to bottle. I have started mine. I soured half and then re-boiled and added to the other half. I also added 3 21oz cans of cherry pie filling and 1.5 lbs of cherries. I have one pint of 100% black cherry concentrate I will add to the secondary. I plan on using brown sugar to bottle. This is my first time experimenting with a sour, if it works (and even if it doesn’t) I will try it again. I kegged this stout this past weekend. It is sitting under gas, so will be ready to go this coming weekend, I will post a follow up when I get to pour a glass and taste it. I opened one of mine on St. Pat’s and it was a little too early. I just had another and I am very pleased. The cherry comes through and the sour at the end is very good. If I have one complaint, it would be the carbonation. I used 3/4 cup of brown sugar to bottle and I think I should have used a full cup. Not bad for a try at a sour, though. I enjoy reading your posts and will try some of your recipes. H.L, how did you sour your beer? I am very much enjoying this stout, but there are many ways to do souring, and I am always curious how others go about it. This was a kit I had. It came with two 3.3 bags of liquid dark malt extract. I took one and boiled it in 2 gals of water for about 20 min and when it cooled to below 130, I added a cup of cracked grain from another kit. I covered it with a sleeping bag for two days. I did not think it was sour enough so I waited another 3 days. I then boiled it along with the rest of the kit in enough water to make 5 gal. I added part of the cherries in the primary and part in the secondary. I will make this again and maybe try to oak the secondary. Any suggestions would be appreciated because I have never tried to oak anything either. I am getting back into brewing beer and wine after about a 15 year break. I just ordered some hop rhizomes so you could say I’m committed. I brewed a 1/2 gallon batch of this to test it out. Probably the best beer I’ve ever made. Thanks for posting the recipe! Oh, I couldn’t get my hands on the yeast you used, so I used a plain Safale US ale yeast in primary and then used Wyeast brettanomyces and lactobacillus in secondary. Left it in secondary for about 6 weeks before force carbonating in a 2 liter bottle, then drank the whole thing over 2 days. I have used Wyeast roeselare before, and I think that would also work well in the secondary. Which Brett did you use?